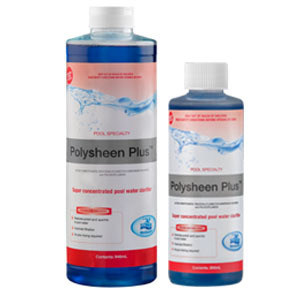 BioGuard Polysheen Plus is a highly concentrated product that combines small particles into larger ones, making it much easier for the filter to remove debris and insoluble compounds. Specially formulated liquid polymer blend. Highly concentrated, yet does not require dilution. Safe for all pool and filter types. Restores the sparkle to your water. Excellent as a problem solver for cloudy pools where chlorine demand is not an issue.